Omega 3 is the most vital fatty acids which our body needs genuinely. However, before consuming anything, you must know everything about it. Omega 3 fatty acids are one of the polyunsaturated fatty acids (PUFA’s) required by the body for maintaining a normal metabolism. The term “polyunsaturated” signifies that this fatty acid contains more than one cis double bond in its molecular structure. The “three” in the nomenclature comes from the fact that the first double bond in this fatty acid is located on the third carbon atom from the end of the organic carbon chain forming the molecule. The double bond is a double edged sword to the function of these fatty acids. On one hand, it makes the entire fatty acid structure more fluid and adaptable. On the other hand, the double bond also decreases the molecule’s overall resilience, allowing most of them to get easily oxidized. The prototype Omega3 (also written as w-3 or n-3) fatty acid molecule contains two ends. The carboxylic acid end containing the -COOH is referred to as the “alpha” end. The methyl (-CH3) tail end forms the “Omega” end that lends its name to the fatty acid itself. What are the Different Types of Omega-3’s and their Health Benefits? 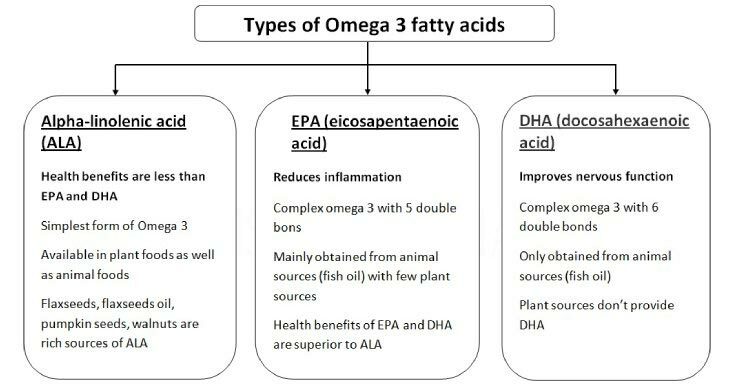 There are three different types of these fatty acids that are required by the human body, namely alpha-linolenic acid, eicosapentaenoic acid and docosahexaenoic acid. The consumption of each one of these is essential for a healthy, disease free lifestyle. Let’s look at these in detail. Alpha Linolenic Acid, commonly abbreviated as ALA, is an 18 carbon long carboxylic acid with three cis double bonds throughout the chain. The scientific name of this essential Omega 3 fatty acid is all-cis-9,12,15-octadectrenoic acid. It is an isomer (compound with same molecular content but the different structural arrangement of the atoms) of Gamma-Linolenic Acid, an Omega-6 fatty acid. First isolated by Roulette in the early 1900’s, this compound is known to play an important role in metabolism. It cannot be produced endogenously in the body itself because of the absence of essential enzymes that catalyze the conversion of stearic acid to ALA, unlike the other two essential Omega-3 acids. ALA must be obtained from one’s diet. The metabolic role of ALA in the body can be broken down into two major categories. The major role of dietary ALA is its use in the human body as an energy source, with as much as 85% of the consumed ALA being used strictly for providing energy to cells and different processes. The second role of ALA is its use as a building block for the endogenous formation of the other two n-3 fatty acids, eicosapentaenoic acid, and docosahexaenoic acid. It is important to note that an ample dietary consumption of the two longer Omega3 fatty acids is essential because their synthesis in the body from ALA holds a very low efficacy. Alpha-Linolenic Acid is an unstable compound prone to spontaneous oxidation. Its oxidative instability and tendency to quickly go rancid is one of the reasons ALA in commercially produced oils is partially hydrogenated to prolong its shelf life. However, the hydrogenation converts part of the Omega 3 into unhealthy Trans fat, which consumers are increasingly avoiding. A ban on the presence of Trans fats in certain commercially produced ALA sources such as soybean oil has spurred the production of a soybean variant that contains ALA less susceptible to oxidation. ALA was previously known to increase the risk of prostate cancer, irrespective if it was taken in synthetic form or obtained through the diet, with multiple studies correlating its consumption to the cancer of the male gland. However, a large-scale study in 2006 has refuted these claims, and currently ALA is known to carry a negligible risk for prostate cancer. In any case, its benefits far outweigh its assumed risks. ALA is also known to have protective effects on the cardiovascular system, playing a part in the prevention of several diseases of the heart and blood such as hypertension. However, unlike its correlation with prostate cancer, this beneficiary effect is specific to its form of consumption, with only ALA naturally present in food providing this effect. The second form of essential Omega-3 fatty acids is eicosapentaenoic acid (EPA or eicosapentaenoic acid). It is a 20 carbon atom molecule with 5 cis double bonds in the chain. Also referred to as Timnodonic acid, EPA is an important precursor of thromboxane-3, leukotriene 5 groups and prostaglandins in the body, namely prostaglandin-3. Prostaglandins are essential for the normal function of the inflammatory system of the body. Those formed by EPA mainly show anti-inflammatory effects and are used by the body to combat excessive inflammation and diseases related to it, such as rheumatoid arthritis and other diseases of an autoimmune origin. EPA is listed as an effective treatment for such diseases and conditions. Apart from its presence in mostly oily fish and seaweed, EPA can be synthesized in the body using ALA as a building block. EPA itself plays a part in the formation of endogenous docosahexaenoic acid. 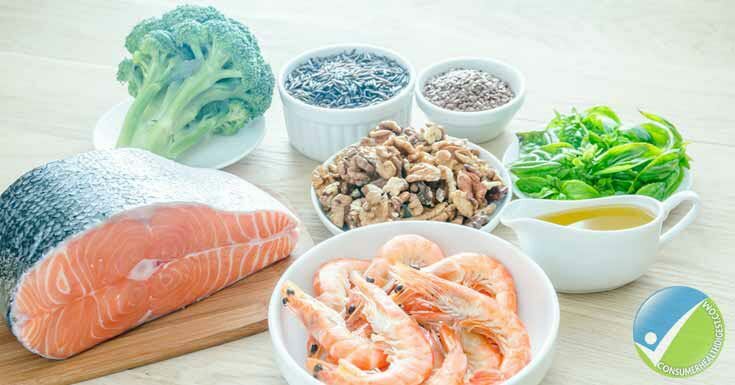 However, these endogenous conversions bear a lower efficiency compared to the exogenous consumption of these fatty acids, with diseases such as diabetes and certain allergies directly limiting the rate of conversion of ALA to EPA. EPA has some unique effects compared to other Omega3 fatty acids. It is known to have therapeutic effects in Schizophrenia patients. Studies have shown that its consumption helps evade depression and depression-like symptoms in subjects with clinical depression. EPA is also shown to have beneficiary effects in patients’ response to chemotherapy since it modulates eicosanoids. EPA may inhibit some hepatic enzymes that are vital to drug metabolism in the liver. Docosahexaenoic acid (DHA) is the longest n-3 fatty acid, with a 22 carbon chain and 6 double bonds. DHA is also known as cervonic acid and is an essential Omega 3 for proper brain function. DHA is the most abundant fatty acid in the brain and the retina. It is an important component of these two, along with the cerebral cortex, skin, sperm and testicles. As mentioned before, it can be synthesized in small quantities by the body if it has an ample amount of ALA and EPA. However, the major chunk of it required by the body must be obtained from natural food sources rich in DHA. DHA plays an important role in the brain. 60% of the brain is fat, and roughly 20% of this fat is DHA. Decreased levels of DHA are associated with a vast assay of brain related ailments, namely Alzheimer’s disease and Parkinson’s disease. Maintaining a proper intake of DHA is known to reduce the progression of these and other neurodegenerative diseases, as well as improve memory. The effect of DHA on cancer cells has undergone vast research, and their effect on inhibiting colon cell carcinoma is well known. Apart from this, DHA also increases the efficiency of chemotherapy on prostate cancer cells in vitro. DHA is a component of the acrosome, an enzyme present in the head of sperm cells. This enzyme is essential for the sperm’s penetration of the egg cell, a process known as fertilization. However, it is wrong to assume that a deficiency of DHA will lead to infertility. The amount of DHA required to form the acrosome is minute, and the body can produce enough of the fatty acid using EPA to ensure that the sperm has the necessary chemicals to cause fertilization. What are the Sources of Omega3 Fats? ALA, EPA and DHA can all be obtained from natural food sources, with only the latter two being produced by the body itself in minor quantities. However, as mentioned before, the amount produced inside the body is far less than the amount required for a normal metabolism, making the dietary consumption of each of these fatty acids a must. ALA is mainly found in seed oils such as soybean oil and canola oil. Chia, perilla and kiwifruit seeds are also rich in ALA. Several nuts like peanuts, almonds and walnuts (both English and Persian) are another good plant source. The thylakoid membrane of the chloroplast of most leaves, especially pea leaves, contains a high quantity of ALA. Flaxseeds contain linseed oil which is probably the richest source of ALA, containing 2.5g of it in one teaspoon. A tablespoon of ground flaxseeds itself contains 1.6g of ALA. However, it is worth noting that solid flaxseeds pass undigested through the human gastrointestinal system and are of no use. Trout, Tuna, Whiting Octopus, Oyster, Scallop. EPA is primarily found in microalgae, with almost no higher plants being a significant source of it. Algae are commercially farmed nowadays as a non-animal source of EPA. It is interesting to note that oily fish such as cod, herring, mackerel, herring, salmon and sardine, which constitute the major animal source of EPA, are themselves not rich in EPA as it was assumed in the past. These fish consume EPA (and DHA) via the algae they consume. 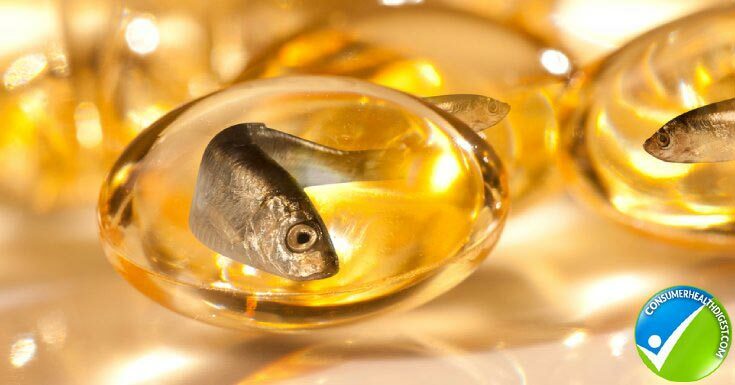 Fish oils like cod liver oil are one of the richest sources of EPA. Human breast milk also contains this fatty acid. Fatty fish, fish oil and microalgae are also rich in DHA. Certain DHA based algae are produced for consumption as they form the main source of DHA for vegans and vegetarians apart from the synthetic versions. Poultry and eggs are also considerably rich in DHA, as is human breast milk. What are the Side Effects of Omega 3 Fats? Like any other essential nutrient, an imbalance of Omega-3 fatty acid levels in the body will produce certain side effects. Most of these side effects stem from the consumption of mainly synthetic forms of Omega 3 fatty acids, or the lack of consumption of sufficient quantities of these essential nutrients. Stomach upsets and nausea are the most commonly reported side effects of Omega3 capsules. Fish oil produces most of these and other side effects. It is contraindicated in diabetes, bipolar disorder, hypertension, depression, hepatic pathologies, seafood allergies and familial adenomatous polyposis. People with an implanted pacemaker are also advised to avoid fish oils. However, in the rest of the population, fish oils appear to be the most easily available and most consumed source of n-3 fatty acids. Athletes are known to consume this source of Omega-3. Cod liver oil is available both as capsules or softgels and in bottled form. Most doctors agree that 1000mg to 1200mg of fish oil per day is essential to obtain a good quantity of Omega-3 fatty acids. However, one must make sure that the preparation of fish oil he or she is consuming has an ample amount of Omega-3’s per serving. The recommended daily allowance of EPA+DHA is 500mg. It is important to know that one standard softgel of fish oil contains roughly 300mg of these fatty acids, meaning that one would have to consume 2 softgels per day to meet the RDA safely. At the same time, it is important to note that these fatty acids can have anticoagulatory effects at high doses and may increase the risk of bleeding, especially internal bleeding after traumas. While this is not an alarming situation in normal individuals, it can cause major complications in people suffering from blood clotting disorders such as hemophilia. Omega 3 fatty acids are Essential Fatty Acids (EFA’s) that play an important part in human physiology. They do not only play a vital role in the maintenance of a healthy metabolism, but also provide resistance to a vast array of diseases such as neuropathology, inflammatory disorders, and cardiovascular diseases. Although their richest sources are animal products, namely fatty fish, they can be consumed in sufficient quantities by vegetarians and vegans due to the commercial farming of vegetative sources high in Omega-3’s. In any case, synthetic forms do exist but carry their own set of side effects that one may or may not experience. As important as it is to make sure our diet has these Essential Fatty Acids in it, it is also important to make sure we are not overdosing on any of them, or ignoring other nutrients such as vitamins and minerals that are vital for other aspects of the human physiology and metabolism. Men 19 and older 1.6 No upper limit has been established for ALA. Fish oil supplements can cause certain side effects such as nausea and gastrointestinal upsets. People with an implanted defibrillator in their heart are generally asked not to consume fish oils. They are also contraindicated in diseases and conditions such as diabetes, bipolar disorder, hypertension, depression, hepatic pathologies, seafood allergies and familial adenomatous polyposis. Fish, on the other hand, is always a better source of Omega-3’s since it carries the most natural form of the fatty acid. Fish also provides other essential nutrients such as protein which fish oils do not. Which one is good for my body EPA, DHA or ALA? ALA, EPA and DHA are all Essential Fatty Acids and should be a part of a healthy diet. ALA is the primary form of energy for the body. EPA is a non-inflammatory agent. DHA is an important component for proper brain function. In short, each Omega3 has a unique and vital function. Is it safe to take Omega-3 while I am pregnant? 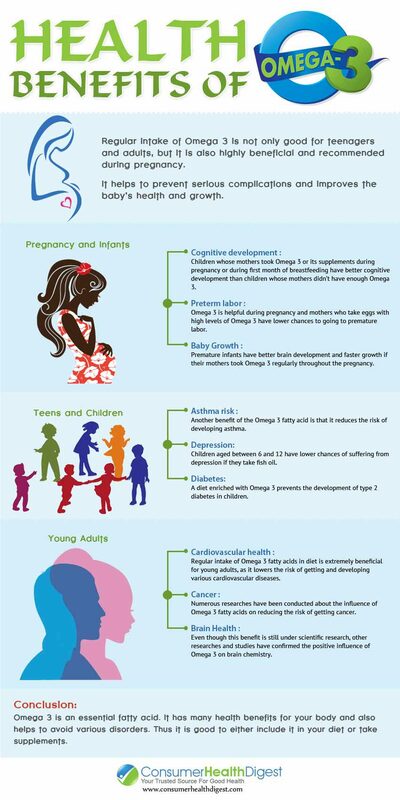 Omega-3 fatty acids are an absolute must for pregnant women. They contribute to the visual and cognitive development of the baby. In addition, they have been known reduce the risk of allergies in newborns. Is Omega-3 for adults only? Omega-3’s are perfectly safe and important for any age group. Is Omega-3 Fats Good to children’s? The positive effects of these fatty acids on the brain in children are remarkable. Does omega-3 eliminate belly fat? Researchers have found a correlation between a healthy consumption of Omega-3 fatty acids and a low BMI. However, BMI is not always synonymous with body fat percentage. Can omega-3 reduce hair loss? Hair loss, or Alopecia, can be reduced by Omega-3 consumption. Omega-3’s, especially DHA, are good for the skin. A healthy skin means healthy hair growth. Does omega-3 have an adverse effect on the prostate? ALA was previously known to increase the risk of prostate cancer. However, a study done in 2006 has proved that there is no such correlation. What happens if I take too much fish oil? A high dose of fish oils can be detrimental if you have any of the conditions contraindicated to its consumption. Consuming too much fish oils has blood thinning effects, and increases the risk of bleeding. Is it safe to take Omega-3 without consulting a Doctor?Do I need a prescription to take omega-3 oils? If you have any medical condition, consulting a physician is always good. Omega-3 rich oils can be consumed safely in most cases without a prescription from a doctor. However, it is always wise to consult a dietician if you have any of the diseases contraindicated to their use, are unsure of the dosage, or have some other ailment.